1. 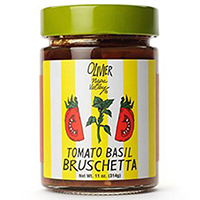 Tomatoes and basil are combined with fresh garlic, extra virgin olive oil, balsamic vinegar and seasoning to create this versatile condiment. Spread over a toasted Sourdough baguette. Spoon over broiled fish or chicken in the final few minutes of cooking. Or simply add mozzarella and heat for a restaurant style hot appetizer.